New York is a city of architectural surprises and treasures. On a small rise above a stone wall at No. 421 East 61st Street is a surprising treasure. The large area of land along the East River where the building now sits was part of a 1676 land grant. In 1795, 23 acres of the property were deeded to Colonel William Stephens Smith, a veteran of the Revolution and the husband of Abigail Adams Smith, daughter of John Adams. The Smiths intended to build their extensive country estate here on what they named “Mount Vernon” in honor of George Washington’s home. Indeed, they began construction of the main house in 1798; but financial problems halted their plans and a year later Smith sold the unfinished building to prosperous merchant William T. Robinson. 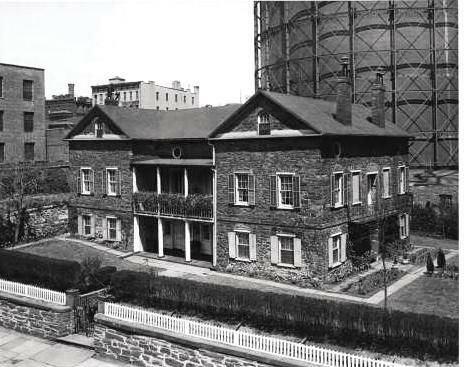 Robinson completed the main house and constructed other fine outbuildings, including an impressive carriage house of Manhattan schist along what would become East 61st Street. Shortly, however, Robinson sold the estate which was converted into a country resort called The Mount Vernon Hotel. The hotel marketed itself as a pleasant getaway from the stress and congestion of the city. It advertised “excellent facilities for fishing, shooting, and salt-water bathing” and its dining room was renowned for “every day in season soup made from the fine green turtles fattening in a crawl made for that purpose in the East River,” which was a mere 50 feet from the hotel. The resort and grounds were converted, in 1823, to an academy for girls. Three years later the main building was destroyed by fire and the large property was divided into lots and sold. Joseph Coleman Hart purchased the plot on which the undamaged coach house stood. 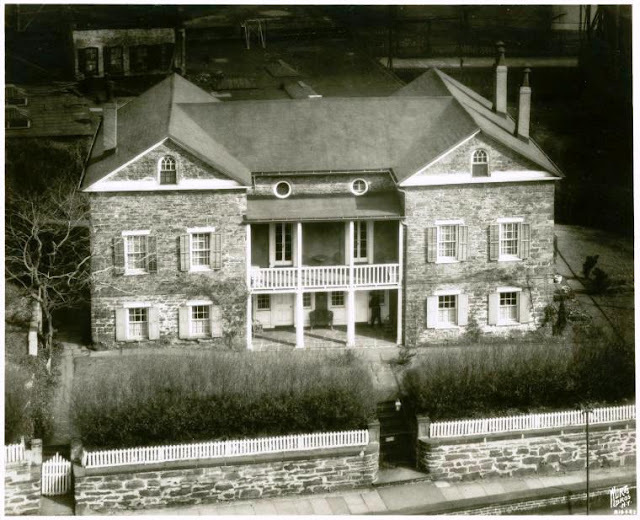 Hart did an extensive renovation of the building, creating a private residence and in 1833 sold it to Jeremiah Towle. The Towle family lived on in the gracious house for 70 years until, in 1905, his daughters sold it to the Standard Gas Light Company. By now the once-rural and verdant area was crowded with breweries, warehouses and enormous gas tanks; one directly behind the house. The group restored the building and grounds, planting an 18th Century-style garden around the house. 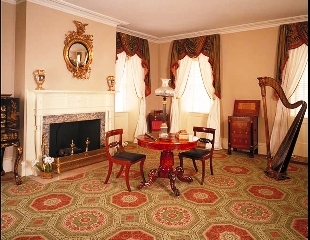 Recognizing the vague connection to Abigail Adams, they outfitted the rooms with Federal furnishings and opened the building as a house museum, the Abigail Adams Smith Museum. In addition to its function as a museum, for decades the house was used for social teas and high-toned gatherings of Manhattan’s wealthy women. When the American Association of Museums granted accreditation to the museum in 1983, the Colonial Dames of America reassessed its focus. 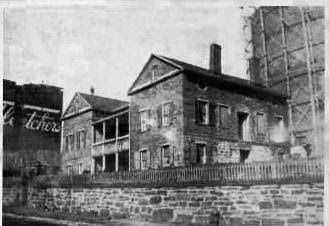 After years of research and planning, the Board of Managers agreed to emphasize, rightfully, the history of the property as the Mount Vernon Hotel. Renamed the Mount Vernon Hotel Museum & Garden, it now interprets for the visitor the resort period of 1826 through 1833. The museum houses an impressive array of American furniture and decorative arts, items of historical New York importance, period clothing and textiles. Concerts, lectures, and history camps are offered. In September 2010 the museum initiated a four-year renovation of the historic gardens, including an “edible kitchen garden. The museum, one of only seven surviving 18th Century buildings in Manhattan, is open to the public from 11 am to 4 pm on Thuesdays through Sundays. Just came back from the tour and even though I have walked passed that corner a million times I would not have know that building was there until reading your blog. Thank you. PS - the staff were great and very helpful, had a wonderful time. glad you found the post and discovered this beauty!